The Panabas Sword, made by Mr Hernan De Guzman in the Philippines by Blade Culture International (BCI) is truly one of the most unique and impressive sub $300 swords I have had the pleasure of owning. 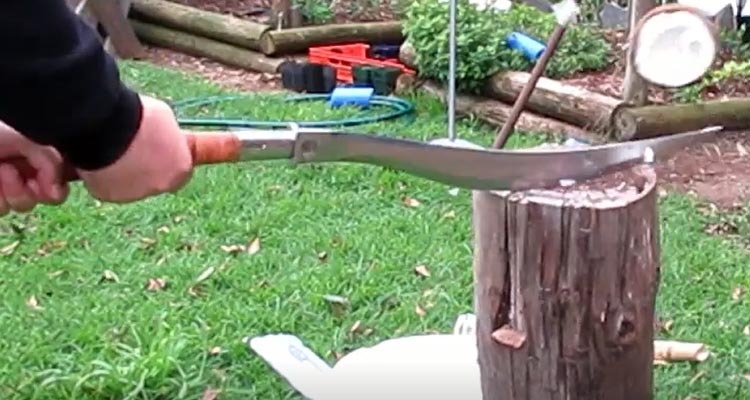 Bascially a weaponized agricultural tool - the extra long handle and shorter, single edged cutting blade makes it a supremely versatile sword - and its name means tool for shaving off..
Understatement of the year..! Because as you will see in this hands on review, this thing does more than just shave off.. I think what drew me to the Panabas sword in the first place was how unique it was compared to other Asian and European swords I am used to handling. In all respects, this is truly quite an impressive and very practical design. 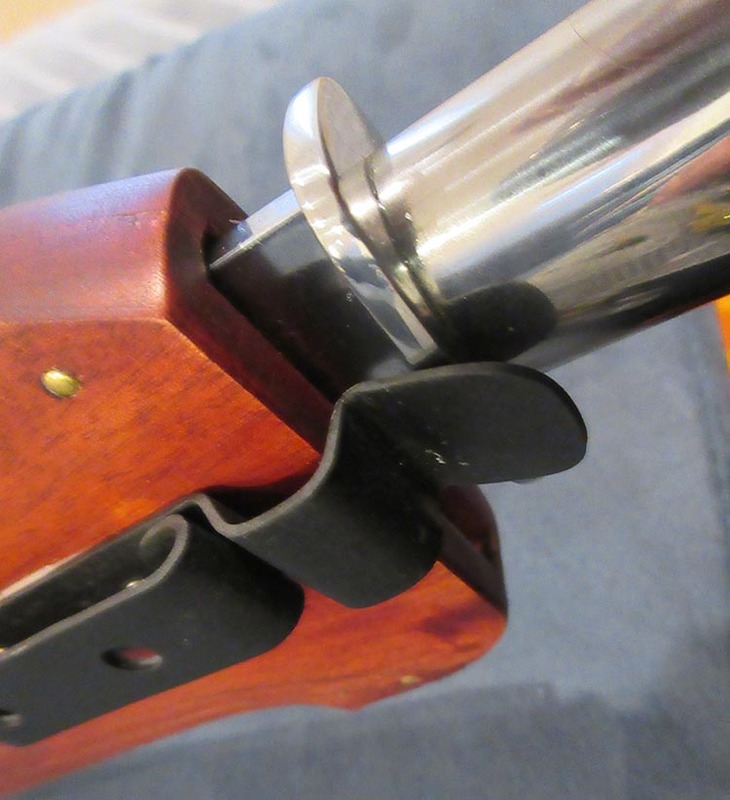 For a start, it had an extremely practical 'locking' mechanism on the scabbard, which was a simple metal clip that served the dual function of clipping the scabbard to a belt and ensuring the blade does not fall out when going about ones duties. But it also serves the purpose of ensuring no one can easily pull it out suddenly and use it against you before you can react. 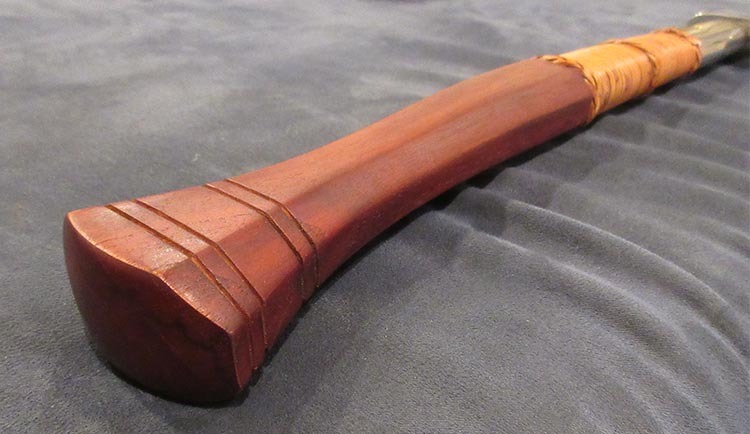 The scabbard itself is quite beautiful in its own right, with detailed and symbolic hand etched carvings, and is reinforced with rivets and strategically placed, super tight rattan bindings. Indeed, the scabbard, which weighs close to a pound, is so substantial that it feels like it could be a weapon in its own right - and grasping the tip and striking with it would produce quite a stunning blow that could easily be followed up with a flash of the blade itself. 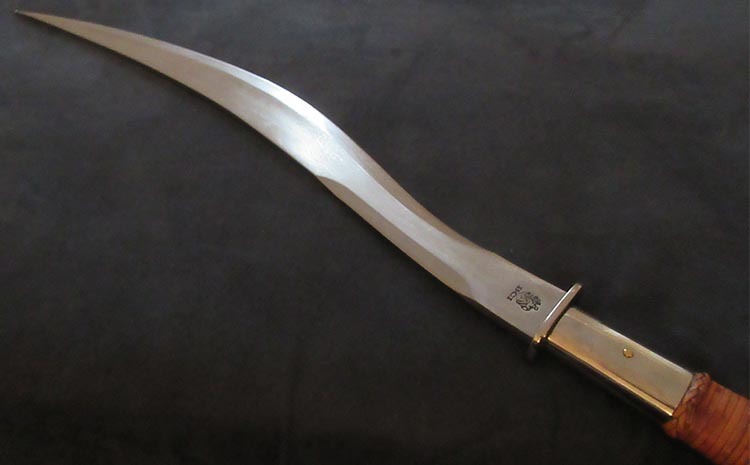 With a length of just over 20", the blade of the Panabas sword is not particularily long. But boy oh boy, just one look at it lets you know it means business.. Forged from 5160 Spring Steel and tempered to a HRC of approx 52-58 like all their Filipino blades - it is one solid feeling length of steel. Too short and stiff to be flex tested, it is immediately apparent that it has two primary cutting areas - the broadest edge of the blade, and the tip, which is extremely long, pointed and capable of rather frighteningly effective stabbing thrusts. The edge is decently honed - not the sharpest blade I have handled, but quite serviceable and with a nice edge, smooth edge profile that could easily be touched up to razor sharp if so desired. The finish is very smooth with a satin polish and it is clear that a lot of hard work has gone into producing it. These swords are made with pride, and it shows. The 14" wooden handle is made from the same materials as the scabbard, with a steel guard, blade collar, rattan wrap and carved wooden hilt. 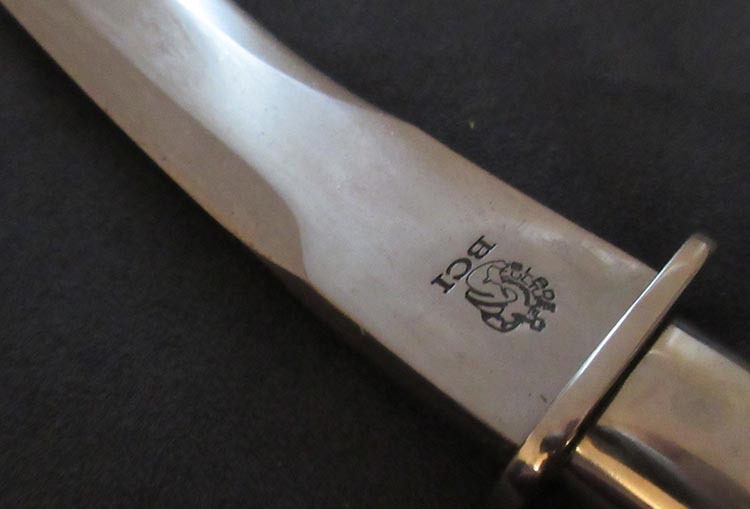 It cannot be taken apart to see exactly how it is assembled, but you can see a single metal peg which firmly secures the hilt to the blade which runs inside the handle. It feels extremely solid - there are no wiggles or rattles whatsoever. 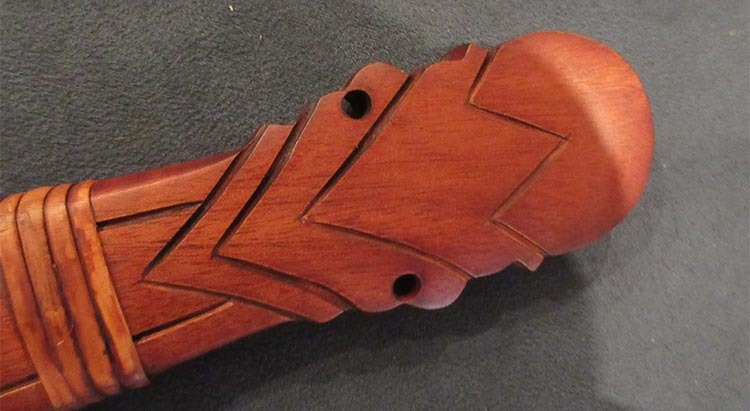 The hilt flares towards the termination point, and is shaped in such a way that it molds to the contours of your hand, ensuring effortless blade alignment. 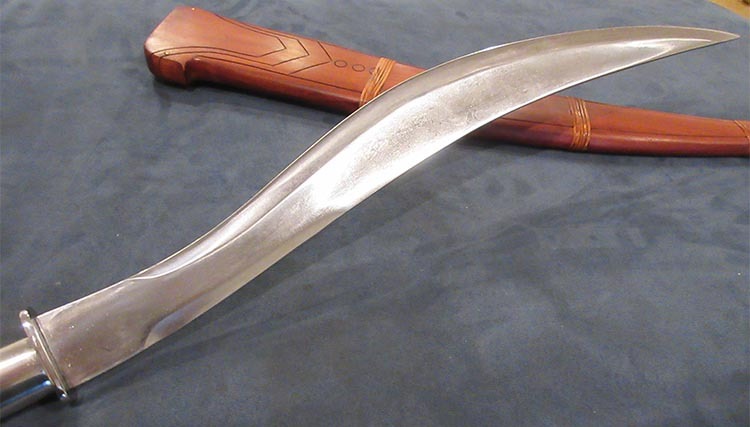 The Panabas sword reminds me a lot of a short hafted polearm - and at just 1.698lbs is light enough and fast enough that it can EASILY be used in one hand or two, making it extremely versatile. I am not familiar with the traditional techniques for this blade - but below is a quick video showing some basic strikes and how easily it flows from one handed to two handed use. Casual handling suggested it could be used in more ways and at more ranges than just about any other sword I have seen. 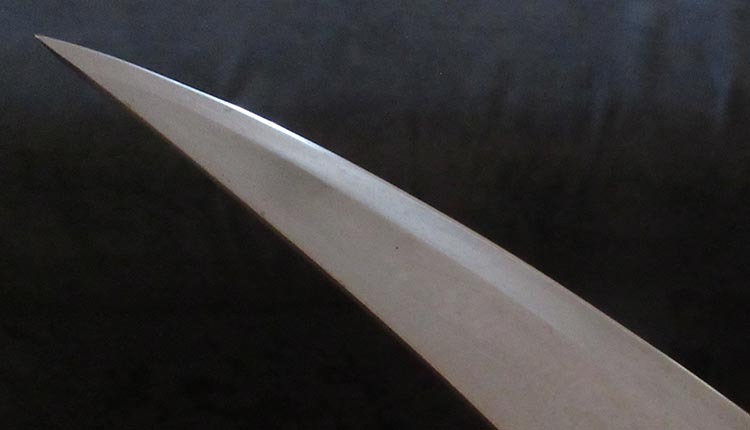 Whether it is traditional or not, the Panabas sword is balanced in such a way that you can easily wield it one handed at any position along the length of the blade allowing it to reach targets almost 30" away - giving it greater reach than a Katana if so desired. But it can also be used to get maximum leverage and cutting power by using it two handed. Definitely interesting - the possibilities seems endless..
Now I had little doubts that this sword would cut - while it is not blade heavy and quite neutral in the hand, I did suspect that it may struggle a little on light targets. 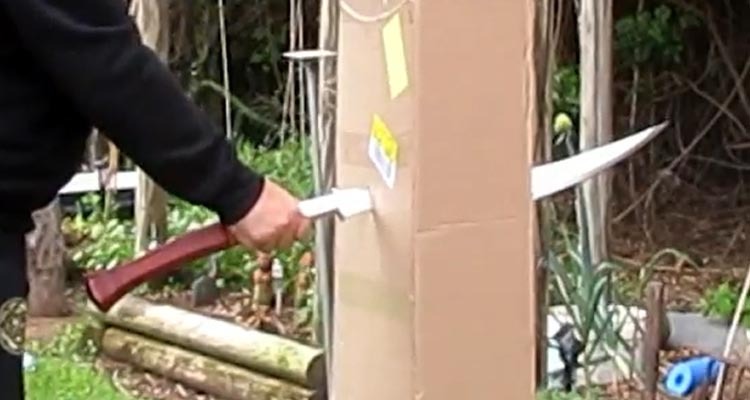 But I need not have worried, it sailed through water filled bottles without a problem, and slashed deeply through cardboard boxes - though the shorter blade and my lack of familiarity with how best to wield it did not allow me to cut the rather large box I was attacking cleanly in half. 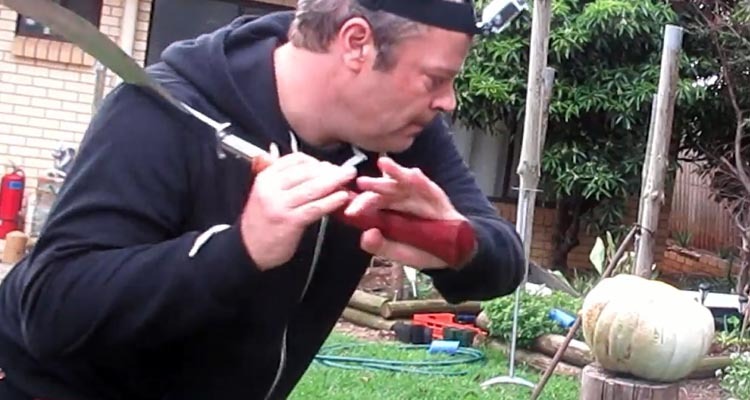 But I did get quite a shock by its stabbing penetrative power..
For the next target was a solid pumpkin (i.e. not hollowed out) - and despite not striking with the optimized part of the blade, the pumpkin was made short work of. Make or break time - but the coconut did not stand a chance..
Now my friend Jason who assisted me on the day of the testing noted a concern with this design. He was worried that the blade collar just below the hand guard looked like a bit of a weak point of this swords design. 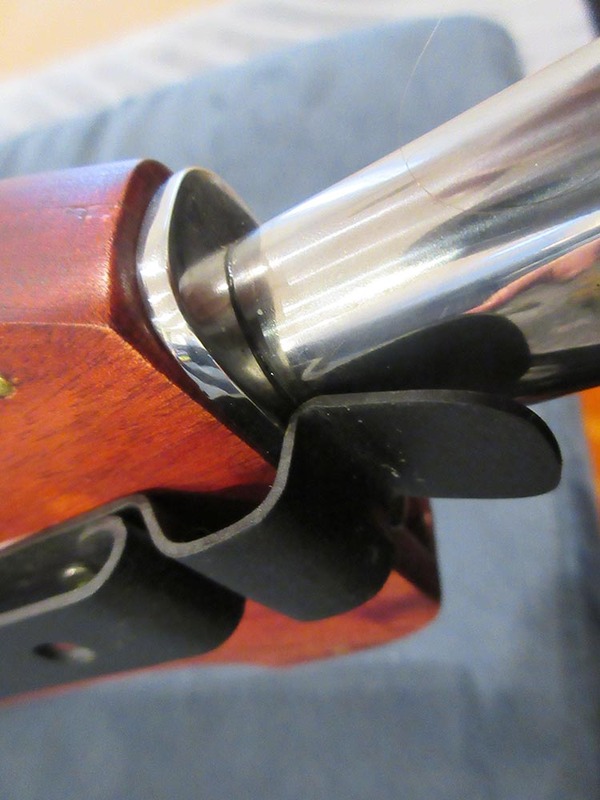 And yes, if the tang was too narrow in there, the pin holding it together not properly attached - this would be a major issue. The only way to know, was to gear up and use it hard against a wooden permapine pell.. If something was going to break or come loose, this abusive testing would reveal it..
Long story short, my suspicions that this was solidly made were confirmed. Even after a series of short, sharp, fast and powerful strikes that chipped away the pine left the Panabas sword as strong, sharp and ready to cut as when I first opened the box..
All in all, this sword passed every test I threw at it and cried out for more.. One of those swords that, once picked up, is hard to put down.. The Panabas Sword by BCI did not disappoint. The level of pride in the craftsmanship, the uniqueness of the blade geometry, its amazingly fast and versatile handling characteristics and completely solid build make this a must have for anyone looking for something truly different - not just enthusiasts of Filipino weaponry. At the current price of $294 it is truly a bargain. Highly recommended.